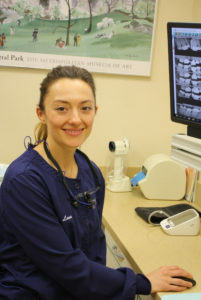 What’s your role here at CPW Dentistry and what does a typical day look like for you? I am one of the dental hygienists at the office. I usually see patients for 6-8 hours a day and then do a few hours of meetings or paperwork afterward because I’m also a team leader. The meetings range in topics from checking in with other clinical team members to see how their month is going, to working on clinical systems like the best way to explain a disease process. Why do you love working at CPW Dentistry? I love working at CPW because every team member is excellent at their job and takes so much pride in their position. We elevate each other! What are you passionate about? Connecting with people, trying new things, and improving at the hobbies I already have. One of my hobbies is indoor rock climbing that I started doing with two girls at the office. In May we will go climbing outside in LA! What motivates you to come to work every day? I love seeing my patients that I have developed a relationship with, seeing my amazing coworkers, and making new connections with patients just starting at our office. You’ve been a patient at the practice too. What has that experience been like? I have had four of our dentists work on my teeth and nearly all the hygienists. I get a lot of compliments from patients on my smile and it’s thanks to the CPW staff! What’s the best way to start the day? I love to stretch and do a couple minutes of yoga and then meditate. I have an outdoor space at my apartment and have meditated outside recently because the weather is warming up. After that I love having a cup of coffee with no distractions, just giving that cup my undivided attention. After that routine, I am ready to start my day!